“This could enable denser devices in a broad range of mobile and compute applications,” said Bill Leszinske, vice president of strategic planning and marketing for non-volatile memory solutions at Intel, in an email. By putting four bits per cell, a technique Intel calls QLC (quad-level cell), the capacity of SSDs could balloon to more than 10TB on standard 2.5-inch drives. Intel said QLC is still under research, and didn’t provide a timeline for the release of flash chips based on the technology. 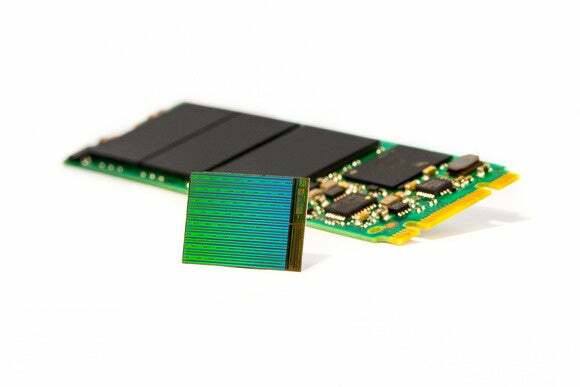 Adding more capacity to SSDs is an ongoing challenge as the geometry of chips gets smaller, and Intel’s technique is one way to expand the life of flash storage, which will likely run its course by 2023, said Jim Handy, an analyst at Objective Analysis. 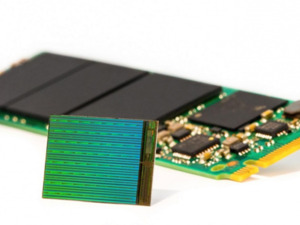 Intel’s ability to put four bits in a cell is tied to the company’s ability to scale down the size of flash chips via its latest 3D NAND manufacturing technology. The technology allows layers of storage cells to be placed vertically, much like a skyscraper, allowing for more capacity. “The expectation for digital data is that it’s 100 percent there or useless,” Handy said. Moreover, this isn’t the first time a company has tried to cram four bits in a cell. M-Systems tried the same close to a decade ago, but failed. SanDisk ultimately acquired M-Systems in 2006. Additionally, there isn’t much incentive to put four bits per cell because of cost issues. It’s possible to cut the cost of a flash chip in half by putting two bits in a cell, and by 30 percent by putting three bits in a cell. The savings could diminish to 15 percent when putting four bits per cell, according to Handy’s estimates.